The top two duties which only Senior Leaders can perform are building culture and setting strategic direction. That’s no surprise. But what is a surprise to most leaders is that measuring the right things gives transformational leverage to building the right culture and setting a strategic direction that gets executed. And this needs some new mindsets for leaders, in order to tap into this transformational leverage. Leaders can’t be just masters of culture and strategy. They must be masters of evidence-based leadership. The first three mindsets of evidence-based leadership make strategy easier for everyone to understand. Mindset #1: Strategic goals are results-oriented, not action-oriented. If the strategic direction is just a list of initiatives or projects, then people confuse action for results. But there is little point in action if we’re not aiming it at the results we want to achieve. Mindset #2: Strategic goals are expressed in language everyone will understand. One of the worst problems with strategy is the excessive use of weasel words. People can’t buy into what they don’t understand. Use plain language to write goals. Mindset #3: Strategic goals are ruthlessly prioritised to focus on performance results that matter most, right now. In The 4 Disciplines of Execution, Sean Covey, et al., explain how achieving strategic goals on top of day-to-day work follows the law of diminishing returns. The more goals we have, the fewer we achieve. The next three mindsets of evidence-based leadership make strategy meaningfully measurable. Mindset #4: Use evidence to learn like a scientist learns, without judgement. 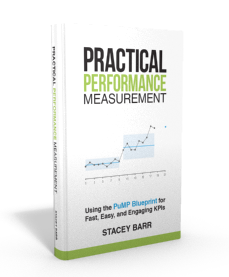 When measures are tools in people’s hands, not rods for their backs, people come to feel excited about using KPIs to improve business performance, and it’s easier for them to feel and be accountable for the right things. Mindset #5: Design measures as quantifications of the observable results of strategic goals. Measures aren’t actions or milestones or trivial counts. They are quantifications of objective evidence of the degree to which performance results are occurring over time. Use real measures, not brainstormed rubbish. Mindset #6: Measure only what can be aligned to the priorities: mission, vision and strategic goals. A clear and measurable mission and vision is the starting point – the inspiration – for aligning the entire organisation’s measurement of their contribution to the execution of the strategy. The next three mindsets of evidence-based leadership make strategy execution result in real improvement. Mindset #7: Implement or execute strategy based on working smarter, not harder. To improve performance, to increase our business’s capacity for excellence, requires leverage. If an improvement can only be sustained by continually putting in more effort, we didn’t find the leverage. Mindset #8: Make strategy execution about removing and managing variability, not about hitting the numbers. We can only understand performance by understanding the patterns of variability in performance. Averages only tell a static story, like a photograph; but variability shows a movie. It’s the patterns we need to look for, not the points. Mindset #9: Execute strategy to improve business processes and how work is designed, not to control people and what work is done. At least 90 per cent of performance problems are in the processes of the business, not in the people. So we must master the measurement of processes, and their outputs and outcomes. The people in an organisation will not practise evidence-based management without it being deliberately led from the top. There are no short cuts. 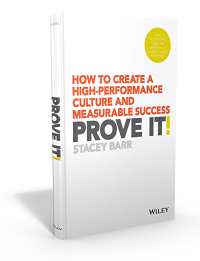 If we want high-performance organisations, we have to be evidence-based leaders, every single day. Hi guys. Here is a challenge for a KPI: “Resilience against climate change”. Any ideas? In what ways would climate change affect us the most? What specific problems would we see or feel? What does being resilient to these problems actually mean? Does it mean we’d avoid them? Or does it mean we’d protect ourselves quickly from them? Or does it mean that we could cope far more easily with their effects on us? Or something else?